Class for creating a constraint between two xyz FEA nodes (points). That is, the two nodes will be joined, as overlapping. Nodes are 3-DOF points that are used in point-based primitives, such as ChMatterSPH or finite elements. "Virtual" copy constructor (covariant return type). Get the number of scalar variables affected by constraints in this link. From item's reaction forces to global reaction vector. From global reaction vector to item's reaction forces. Takes the term Cq'*L, scale and adds to R at given offset: R += c*Cq'*L.
Takes the term C, scale and adds to Qc at given offset: Qc += c*C.
Sets to zero the known term (b_i) of encapsulated ChConstraints. Adds the current C (constraint violation) to the known term (b_i) of encapsulated ChConstraints. Adds the current Ct (partial t-derivative, as in C_dt=0-> [Cq]*q_dt=-Ct) to the known term (b_i) of encapsulated ChConstraints. Adds the current jacobians in encapsulated ChConstraints. Get the reaction force considered as applied to ChShaft. Update all auxiliary data of the gear transmission at given time. Method to allow serialization of transient data to archives. Method to allow deserialization of transient data from archives. Set the status of link validity. Tells if all constraints of this link are currently turned on or off by the user. User can use this to enable/disable all the constraint of the link as desired. Tells if the link is broken, for excess of pulling/pushing. Set the 'broken' status vof this link. Set the pointer to the parent ChSystem() and also add to new collision system / remove from old coll.system. Access to the list of optional assets. Access the Nth asset in the list of optional assets. Get the number of scalar constraints, if any, in this item. Get offset in the lagrangian multipliers. Set offset in the state vector (position part) Note: only the ChSystem::Setup function should use this. 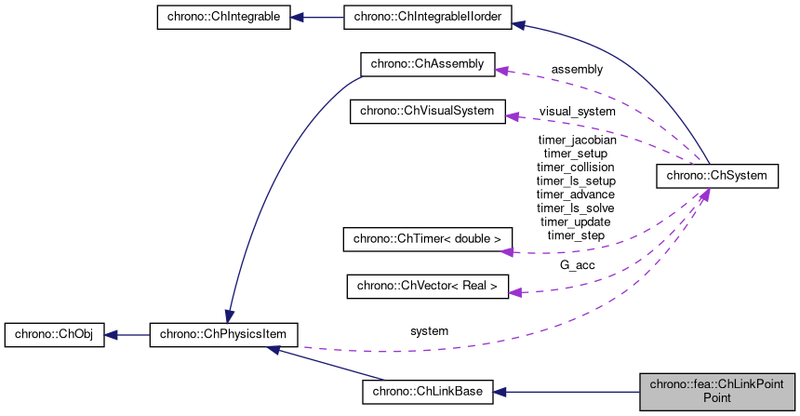 Set offset in the state vector (speed part) Note: only the ChSystem::Setup function should use this. Set offset in the lagrangian multipliers Note: only the ChSystem::Setup function should use this. Sets the 'fb' part (the known term) of the encapsulated ChVariables to zero. Adds the current forces (applied to item) into the encapsulated ChVariables, in the 'fb' part: qf+=forces*factor. Adds the current Qc (the vector of C_dtdt=0 -> [Cq]*q_dtdt=Qc ) to the known term (b_i) of encapsulated ChConstraints. Adds the current link-forces, if any, (caused by springs, etc.) to the 'fb' vectors of the ChVariables referenced by encapsulated ChConstraints. Gets the numerical identifier of the object. Sets the numerical identifier of the object. Gets the simulation time of this object. Sets the simulation time of this object. Gets the name of the object as C Ascii null-terminated string -for reading only! Sets the name of this object, as ascii string. Gets the name of the object as C Ascii null-terminated string. Sets the name of this object, as std::string. link is broken because of excessive pulling/pushing. Fetches the reactions from the lagrangian multiplier (l_i) of encapsulated ChConstraints. Mostly used after the solver provided the solution in ChConstraints. Also, should convert the reactions obtained from dynamical simulation, from link space to intuitive react_force and react_torque. Get the link coordinate system in absolute reference. This represents the 'main' reference of the link: reaction forces and reaction torques are expressed in this coordinate system. Child classes should implement this. Use this function after object creation, to initialize it, given the two nodes join. The attachment position is the actual position of the node. 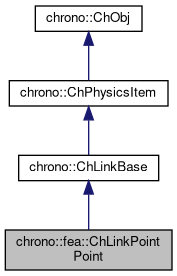 Note, mnodes must belong to the same ChSystem. Tell to a system descriptor that there are constraints of type ChConstraint in this object (for further passing it to a solver) Basically does nothing, but maybe that inherited classes may specialize this. A community project led by the University of Wisconsin-Madison and University of Parma-Italy. Generated on Tue Apr 23 2019 05:39:08 for Project Chrono by 1.8.9 .